"Never take your mistress on an annual guys' getaway, especially one devoted to hunting - a violent lesson for three wealthy married men." Neon has debuted an official red band trailer for an action thriller titled Revenge, from newcomer Coralie Fargeat making her feature directorial debut. This played to some rave reviews at Fantastic Fest and TIFF last year, and seems like a gritty film with a helluva pitch (see the one-line synopsis at the start of this post). Matilda Lutz stars as Jen, with a cast including Kevin Janssens, Vincent Colombe, and Guillaume Bouchède. It's described as a "razor-sharp feminist subversion of the revenge-thriller", that "gloriously blurs the lines of vengeance and survival while simultaneously delivering a ferocious dissection of gender and genre." Sounds awesome, doesn't it? Yes, you might want to take a look. Jen (fearlessly embodied by Matilda Lutz) is enjoying a romantic getaway with her wealthy boyfriend which is suddenly disrupted when his sleazy friends arrive for an unannounced hunting trip. Tension mounts in the house until the situation abruptly––and viciously––intensifies, culminating in a shocking act that leaves Jen left for dead. Unfortunately for her assailants, Jen survives and reemerges with a relentless, wrathful intent: revenge. 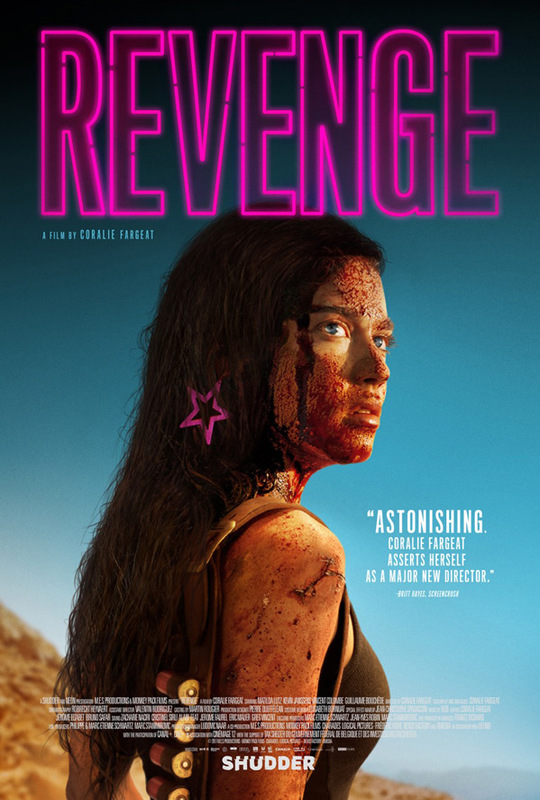 Revenge is written and directed by up-and-coming French filmmaker Coralie Fargeat (follow her @coraliefargeat), making her feature directorial debut after a few short films previously. This first premiered at the Toronto Film Festival and Fantastic Fest last year. Neon will release Fargeat's Revenge in select theaters + on VOD starting May 11th coming up. What do you think? Who's in?